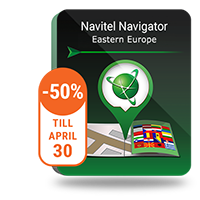 Europe Q1 2018 maps are now available to the users of Navitel Navigator. Q1 2018 map update is available for the following 44 countries: Albania, Andorra, Austria, Belgium, Bosnia and Herzegovina, Bulgaria, Croatia, Cyprus, Czech Republic, Denmark, Estonia, Finland, France, Germany, Gibraltar, Great Britain, Greece, Hungary, Iceland, Isle of Man, Italy, Latvia, Liechtenstein, Lithuania, Luxembourg, Macedonia, Malta, Moldova, Monaco, Montenegro, Netherlands, Norway, Poland, Portugal, Romania, San Marino, Serbia, Slovakia, Slovenia, Spain, Sweden, Switzerland, Ukraine, and Vatican City State. The updated maps contain 9 897 263 km of road graph, 4 955 487 POI, 708 327 settlements, 324 275 of which are provided with the detailed street network and support address search. Part of the B123 highway. Towns of Belitsa, Stara Zagora and Yakoruda have been detailed. The road graph and address base of Ivaylovgrad, Razlog and Sofia has been updated. A new part of the A1 highway (Svilaj-Odžak) has been added. Part of the highway D538 near Virovitica. A new road has been added to the arrival zone at the international airport near Pardubice. The following schemes for ferry routes are specified and corrected: Ebeltoft-Sjællands-Odde, Grenaa-Anholt, Grenaa-Varberg, Göteborg-Kiel, Kalundborg-Århus, Kiel-Oslo, SjællandsOdde-Århus. The border crossing from Karelia to Finland in Syväoro is closed. Addresses in Vantaa have been added and corrected. The road network is updated on the basis of video tracks. The base of speed cameras (Speedcams) has been updated. Part of the bypass road No. 8 (south of the city of Várpalota). Weight-size and other restrictions on the freight transport have been added. The road network of Italy is updated. Updated footpaths in the parks of Verona, Milan, Rome, Turin. Processed video tracks around the southern part of the country, including all traffic junctions. Changes have been made to the Chisinau road network. Information about all major roads in the central and northern part of the country has been updated. Video tracks have been processed on the main roads and in Oradea. retail chains MEGA IMAGE and PROFI. The following brands have been added to the POI database: ALPHABANK, Auchan, AVIS, BANCAROMÂNEASCĂ, BANCATRANSILVANIA, Bancpost, BANKLEUMIROMANIA, BCR, Bershka, BILLA, BRD, C&A, Carrefour, CECBank, cora, CREDITAGRICOLE, CreditEuropeBank, DRISTORkebap, Europcar, GarantiBank, GASPROM, H&M, IdeaBank, INTESASANPAOLOBANK, Kaufland, KFC, lamama, LaPLĂCINTE, LIBRA INTERNETBANK, LIDL, LUKOIL, MANGO, MARFINBANK, McDonald's, MEGAIMAGE, Mercedes-Benz, Mesopotamia, METRO, MOL, NewYorker, NISSAN, NOBELOIL, OMV, OroTorro, OTPBank, PATRIABANK, PENNYMARKET, PETROM, PIRAEUSBANK, PizzaHut, PORSCHEBANK, Praktiker, ProCreditBank, PROFI, RaiffeisenBANK, real, rompetrol, SELGROS Cash&Carry, SUBWAY, TOYOTA, UniCreditBank. Video tracks have been processed in the central part of the country. Video tracks have been processed on the main roads in the west part of the country. A new part of the highway A4 (Lancova Vas - Podlehnik) is added. In accordance with the Law of Ukraine "On Local Self-Government in Ukraine", the Law of Ukraine "On the assignment of names (pseudonyms) of individuals, jubilee and festive dates, names and dates of historical events to juridical persons and objects of urban subordination", the Law of Ukraine "On condemnation of communist and national-socialist (nazi) totalitarian regimes in Ukraine and the prohibition of propaganda of their symbols", and on the basis of the decisions of local city councils, the streets were renamed in the settlements: Arkadyevka, Bakhmach, Bobrovitsa, Borzna, Varva, Volodarka, Vysshaya Dubechnya, Gorodnya, Grigorovka, Gusachevka, Dolina, Zgurovka, Irpen, Kozelets, Kozin, Krasnoe, Lebedevka, Matyashevka, Nizhyn, Novograd-Siversky, Novy Petrivtsi, Obukhovichi, Pryluky, Repki, Sokyriany, Sumy, Turovka, as well as in the settlements of Bobrovitsky, Ichnyansky, Kozeletsky and Koryukovsky districts of the Chernihiv region. According to the resolutions of the Verkhovna Rada of Ukraine, 36 settlements were renamed in the Chernihiv region. A detailed road network has been created in 52 settlements: Baturin, Bakhmach, Berezna, Berestovets, Bobrovitsa, Bolotnitsa, Borzna, Varva, Velika Vys, Volodkova Dyvitsa, Golubichi, Gorodnya, Degtyar, Desna, Dmitrovka, Dobryanka, Zhuklya, Zamglai, Zvenichyv, Ivanitsa , Ichnya, Kobyzhcha, Kozelets, Korop, Koryukovka, Ladan, Lynovytsa, Lopatni, Losinovka, Lyubech, Lyubecaninov, Makoshino, Mala Dyvitsya, Malokakhovka, Mykhailo-Kotsyubinskoe, Novgorod-Seversky, Olishevka, Oster, Parafyivka, Pochaev, Radul, Repki, Rozhnyatyv, Sednev, Semenovka, Siberezh, Slobodka, Snovsk, Schastlive, Talalaivka, Trostyanets, Yaduty. Charging stations for electric vehicles of AutoEnterprise company (AutoEnterprise) have been added to the map. The traffic schemes in the cities of Irpen and Simferopol are updated. POI have been added to the maps of the following cities: Kyiv, Odessa, Uzhhorod, Feodosia, Chernigov, Yalta, as well as in the settlements Petrushi (Chernihiv region), Slavsko (Lviv region), Schastlive (Kyiv region), Khodosyvka (Kyiv region). Mistakes in streets naming on the territory of the Autonomous Republic of Crimea have been fixed. New POI have been added: AutoEnterprise, lifecell, Vodafone. The address base in the cities of Birmingham and London has been updated. New brands have been added to the POI database: Beefeater, Crown Carveries, Ember Inns, GREGGS, Miller & Carter, Nando's, Pizza Hut, Toby Carvery, wetherspoon, YOUNG'S. The routing has been fixed in the following areas: Blekinge, Kalmar, Gotland. A section of the highway A5 - bypassing Biel (A5 Biel / Biennebypass) has been added. Important! Please note that the maps of the Q1 2018 release work with Navitel Navigator version 9.7.2493 onwards.